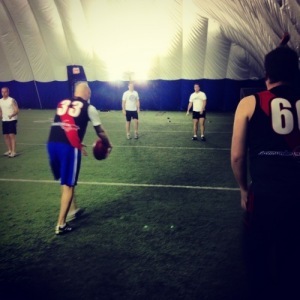 The Toronto Dingos Indoor Winter League is an initiative started last offseason to act as a culmination of the Dingos winter trainings, as players shake off the rust (and pounds) of the holidays and begin the long process of rounding in to form for May. The event is also a perfect way for new players to get a sense of the game of Aussie Rules, much more so that any triangle work or kick-to-kick drill could explain. With a strong new group of recruits and high hopes for the coming 2013 AFLO Season, the coaches led by head coach Justin Robertson were keen to see this tradition continue, seeing the combination of a bit of competitive fun for the vets and a training trail-by-fire for the rookies as a fantastic way to grow the club and build towards the season. With the player signed up and split into four squads - captained by Shaun McKay, Anthony O'Brien, Tom Bell and Spider Wells - the stage was set for a fantastic four-week event in the cold confines of the UCC Dome. What started as a blowout in the first half quickly became a nail-biter for Team Shauny, who endured three quick goals from Team Spider in the opening minutes of the second half, only to have some shady play from Team Spider's fullback (whoever that was) kill the momentum and give Team Shauny the close victory. The rust was showing for Team Spider in the early going, but some line-up swaps and a good healthy run lifted the team and led to a steady improvment quarter-to-quarter. Despite the loss, the team took pride in winning 3 of the 4 quarters. What started off as a tight contest was blown wide open in the 2nd quarter, as Team OB played with a bit of veteran savvy, holding Wellsy and OB in the backlines as setup options and allowing the rovers to make plays in the middle. Despite battling hard in the 1st and 3rd, two goaless quarters killed it for Team TB, who found themselves smothered by the aggressive play of Team OB's midfielders (I blame Yoni). A cold night for footy, Team TB couldn't quite get their legs under them and had troubles keeping up with an aggressive group of Team Spider midfielders, led by Wade and the always unflappable Gazza. From first bounce to last siren, Team Spiders were on the right end of things, getting their fair share of lucky bounces, contests, and calls from the umpy. The game quickly got out of Team TB's hands, who slipped to an 0-2 record overall. What started out as the match of the night quickly got out of hand in the second half, as the shorted-handed defense of Team OB wore down and the quick cuts of Team Shauny midfielders took advantage. Some fantastic play on the run from Pickers and Mal - setup nicely from Bobby in the backline - blew the game wide open in the 3rd quarter, and Team OB had little-to-no gas in the tank and failed to respond at all. As the dust settles from the first two weeks of the Indoor Winter League, one team has already pulled ahead of the pack and is sitting pretty with a 2-0 record and a berth to the Grand Finals in Week 4. Admist the skinned knees and mucked kicks, Team Shauny will face the winner of Week 3's matchup between Team OB (1-1) and Team Spider (1-1), which will undoubtedly feature a brawl of the brothers at some point (Spider's climbing the ladder!). As such, the other Week 3 matchup (Team Shauny vs Team TB) will have no impact on the Week 4 Finals series, as both teams have secured their places in the (ahem) respective Finals. Best of luck to all teams in the final two weeks of the 2nd Annual Toronto Dingos Indoor Winter League!